Popular social networking and sharing app Path re-launched back in December and has since become extremely popular, with lots of geeky mobile types sharing their updates, locations and photos with one another. However, it’s not just mundane status updates you can share with friends and followers now, but you can also hook your Nike+ account up to Path too, to show everyone just how sporty you are! For those of you who haven’t come across Path quite yet (it is pretty new) it’s an application, but it’s also like a social network too, you just can’t do everything from the web, a little like Instagram. It’s meant to be a simple way to share key moments of your life, through photos, videos, thoughts and locations. Most of the social networks we use at the moment are obsessed with making us share everything with everyone, but Path is different in that it wants you to only share important things with a few of your nearest and dearest. As dedicated Path users here at Connected Health, we were obviously really excited by the news that our new favourite app has now got Nike+ integration after its latest upgrade. This means that runs can be automatically sent through to your Path once you’ve completed them. However, friends won’t just be able to see you’ve been keeping yourself active, they’ll also be able to view time, distance, pace and the route you took overlaid on a map. It’s great that the integration has brought all of these new features with it, because at the moment if you sync up your Nike+ and Facebook accounts you usually only see the distance and not detailed information about your route. 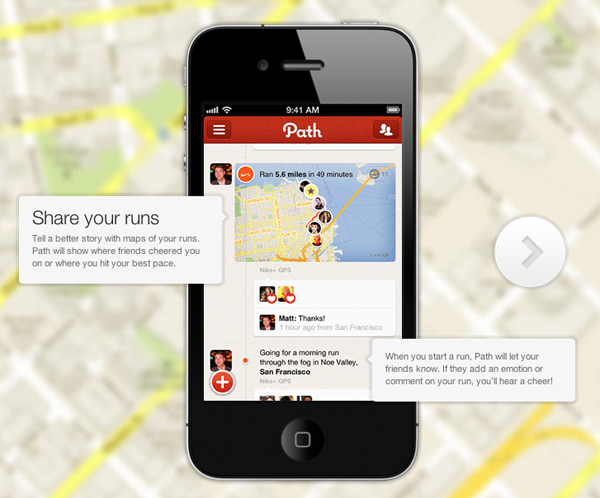 The appealing thing about Nike+ and Path getting together, is that you only share your Path with a select few friends. This means if you’re sometimes a bit wary about telling ALL of your Facebook friends and ALL of your Twitter followers about your daily runs and where you’ve been but still want to share them with someone, then Path would be a great place to do just that. Go check out the Nike+ and Path integration now.